The Quarter had its boundary in Janské Square, hidden here behind a group of low-rise houses on the left. The picture shows how the water front looked before the clearance. On the left we can see a building of the German-Jewish school and the western front of the St Simon and Jude Church. In front of this Church we can see the as yet extant Cyriac Church, but the plot on which stood the former Cyriac Monastery is already covered with newly built structures. The gradually sloping bank in front of the little square would be elevated in less than a decade by 7 to 8 metres in order to allow conversion into a bridgehead for the Svatopluk Čech Bridge. This bridge connected the opposite bank of the Vltava with the newly arisen Mikulášská Street. The low-rise buildings behind the front row of houses were a part of the neighbouring quarter of Josefov with its Jewish ghetto. On the right, on plot No. 873, a group of mill-related buildings with Baroque gables stood until 1880. In their place arose the building of the German-Jewish School demolished in 1913. On the opposite side, in the corner building No. 874, was the ill-famed pub U Lišků, renowned for its frequent breaches of the peace. The complete block of buildings, together with two other houses, was demolished in the years 1905-1907. The building in the background, No. 265 (a part of the ghetto) is already the target of demolition efforts aimed at clearing the area to extend Mikulášská Street to the embankment. On the extreme left, in the place where until 1890 stood the Cyriac Monastery, we can see a part of a new building, No. 1033. The Baroque statue of St John Nepomuk was moved to the Church of the Holy Spirit in 1913. The perspective offers us a view of the street U Obecního dvora. The place itself was used since the Middle Ages as a market for trading live goats, goat meat and kid shoes. The shoemaker craft survived here into the 1930s. The many stalls and little shops offered here solid, hand-made footwear. One of these little shops can be seen on the ground floor of the tenement building No. 916. the row of houses on the left was demolished in 1904. The corner building (in the middle of the picture) was built in 1852. The structures, Nos. 792-794, on the opposite corner were demolished during the clearance and replaced by a new building. On the extreme right, in the elevated area, we can see another new building which replaced the previous structure, No. 748, known as the so-called New Ungelt. The reason for the name goes back to the 1779 removal to this building of the customs office from the original old Ungelt-Týn in the Old Town. The new Ungelt served also as a lottery office until demolition of the building in 1898. Upon the abolition of the Convent, the street was used as an access road to the small square Na Františku. 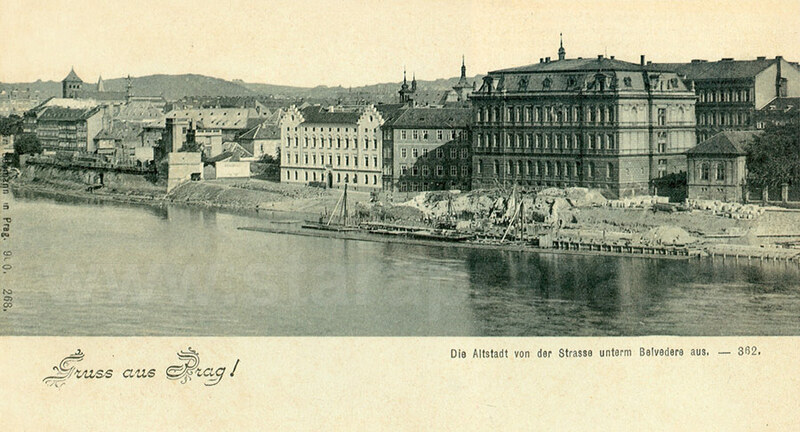 Later, from 1891, this was the bridgehead of the makeshift bridge to the Letná Quarter on the opposite bank of the Vltava. 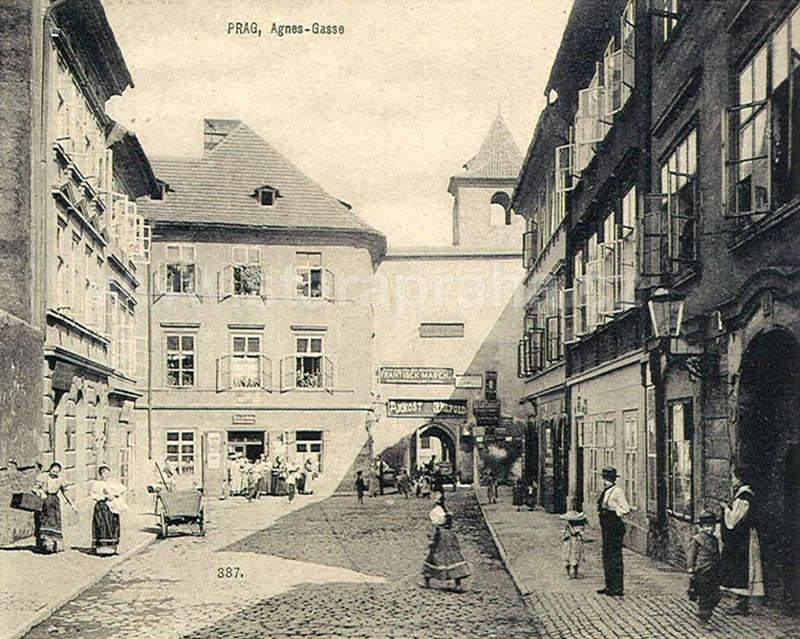 Anežská is one of the five streets in this Quarter which escaped the clearance zeal and which are retained in their original appearance from the turn of the century. On the left we can see a wall of a large garden, building No. 807 of 1878 (the most impressive building in the street), and No. 806 of 1843 on the crossing with U Obecního dvora Street. Hiding behind the tall convent wall is an entrance court tower. The former Chapel of St Michael can be found to the right of the entrance, beyond the city line and beyond house No. 986, built in the convent garden in 1844. At the time of the taking of the picture it was used for storing coal and wood. The next two buildings to the right were reconstructed in a Neo-Classical style around 1840, while the house No. 809 retained its Baroque portal. This structure, known as U Černé ruky (The Black Hand), was owned in its time by wife of the Baroque painter K. Škréta (1610-1674), Veronika. With the Franz Josef I Bridge on the left, and with the eastern section of the na Františku Quarter on the right. The picture is dominated by a more than 100-metre long wall fence of the municipal enclosure Na Foustkách, at that time used as a garden. Until not so long ago it served as a saw-mill and a timber storage place with woodpiles standing several metres high. The high stone wall was meant to protect the enclosure from frequent flooding. Behind the enclosure you can see buildings 150 to 300 years old, mostly demolished between 1927 and 1976. 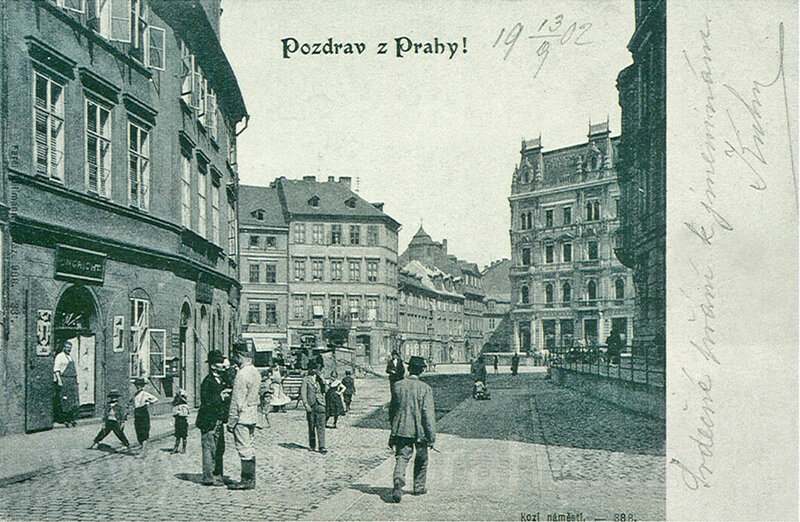 The small square Na Františku (extreme right) saw in 1891 the construction of a makeshift wooden bridge to the Letná Quarter. It served to keep traffic flowing during the ongoing reconstruction of the Franz Josef I Bridge, and in order to facilitate the access of throngs of visitors to the Jubilee Exhibition. The Bridge was used until 1898 when it was disassembled and moved to Ostrava. The embankment in this section of the Quarter was regulated in the years 1900-1904. This meandering street was the longest in the Quarter and connected Dlouhá Road with the small square Na Františku. We are invited to share the painter’s view after 1901. It was then that the continuous housing development on the left side was interrupted by demolition of buildings Nos. 855, 856 and 857. This connected the formerly closed Bílkova with Kozí Street (on the left). Behind the wooden fence we can see a yard of the more distant building No. 852 with a porch (extreme left). Its front is facing U Milosrdných Street. On the left we can still see buildings Nos. 854 and 853 which were demolished in 1907. The whole left side of the street was then elevated and covered with new buildings. The row of buildings on the opposite side has been preserved till today. The low structure on the right, No. 795, is a part of the four-storey building in Kozí Square (see picture 140 - in the background on the left). Further, behind Nos. 1002 and 799, you can see the side wall of a three-storey structure built in 1889. They were replaced in the 1930s by the still preserved buildings, new Nos. 803 and 804, (these numbers were originally used for demolished buildings in U Obecního dvora Street). Later rebuilt in the Baroque or Neo-Classical style, was inhabited in the 15th century by drapers. In the picture we see U Obecního dvora Street from Haštalská Street (formerly Kozí Square). The left side of the street was surprisingly not demolished during the clearance, and can be seen even today. 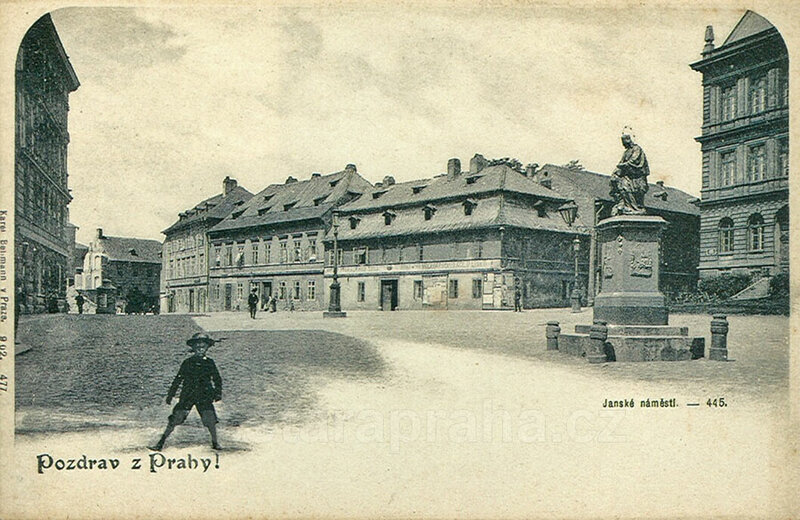 On the left you can see a part of the corner building U Zahrádků, No. 796, built in 1852 on the site of the original 17th-century structure. The building U Bílé labutě (The White Swan), No. 797, housed a hairdresser’s. Another building in the street, U Cenzorů (The Censor’s House), No. 798, capped with a little tower, is remarkable both because of its style and one of its inhabitants. In 1793, following a fire, it was rebuilt in Neo-Classical style, and sold to F. Meyer, a feared imperial censor. Another structure, No. 799, a four-storey building with an attic and a passage to Kozí Street, was owned in the 15th century by a draper named Kussenpfennig who gave the house his name. The last building in the row, with a gate leading to the courtyard, is Obecní dvůr (The Municipal Courtyard), No. 800, serving at the beginning of the 20th century, together with a part of the neighbouring building, as fire brigade barracks. On the left you can see the Zandt enclosure, No. 872, used for storing wood, and protected from the Vltava River by a wall. Behind the enclosure, in the small square Na Františku, the row of buildings ends at the entrance into the former convent (see picture 150). In the middle one can see the white Špinhaus (a borrowed word from the German, meaning spinning house) used in the 17th century as a saltpeter workshop. In the 18th century the building was converted into a prison where the inmates wove (spinnen in German) linen and cloth, hence its nickname. The area in front of it was until recently occupied by three small houses inhabited by raftsmen, and also by a storehouse full of porcelain products. 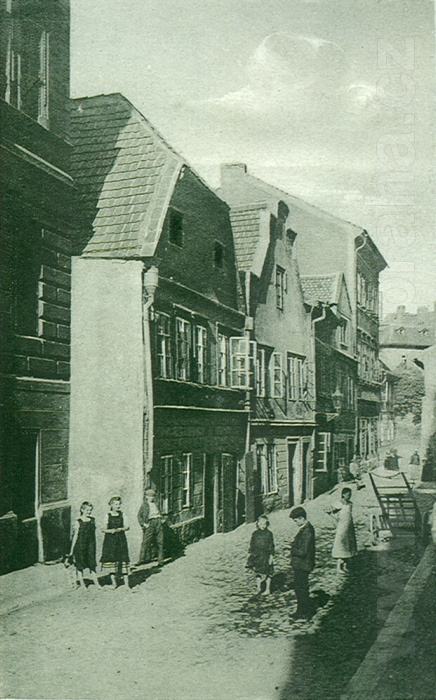 In the neighbourhood of the Špinhaus you can see a tenement house, followed by the four-storey German-Jewish School, No. 873. On the right, behind the garden of the one-storey building, is Janské Square. The embankment in this area is being built downstream. On the extreme right you can see a part of the embankment already finished, while work in front of the school continues. The ground here is not only elevated, but it is also broadened by approximately 5 to 6 metres. No. 800, serving at the time of the picture as fire brigade barracks. These were housed not only in this large building, but also in a part of the neighbouring Kussenpfennig house, No. 799. 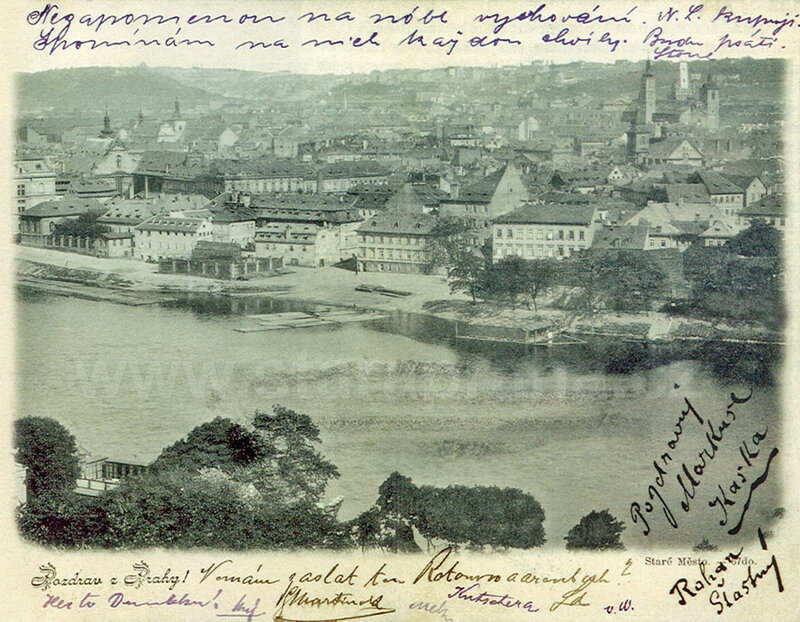 In the middle, in the background, we can see a roof of a two-storey building known as Husákovský, No. 816, in U Milosrdných Street. 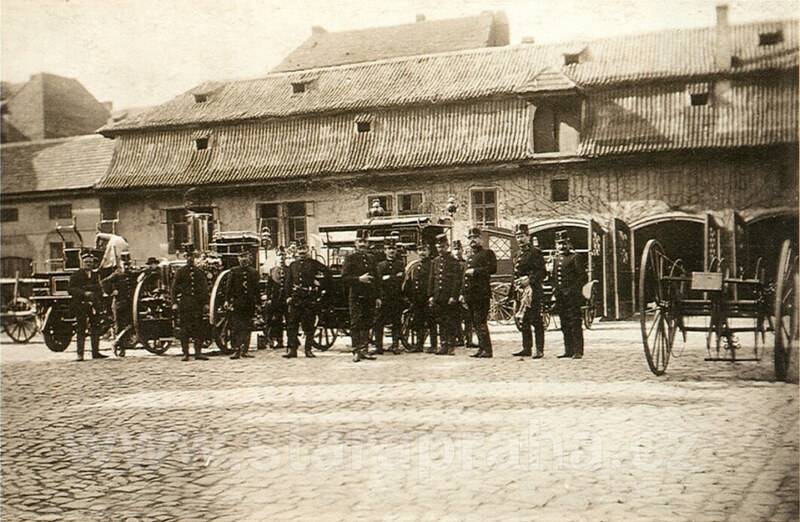 The photographer captured the Old Town Fire Brigade in the middle of a routine checking and maintenance of its wagons. On the left you can see the wagon which transported firemen, already driven by motor power, next to it a steam-driven fire-engine with a shining chimney, and yet another used for transport of firemen produced by the British company W. A. Stone. 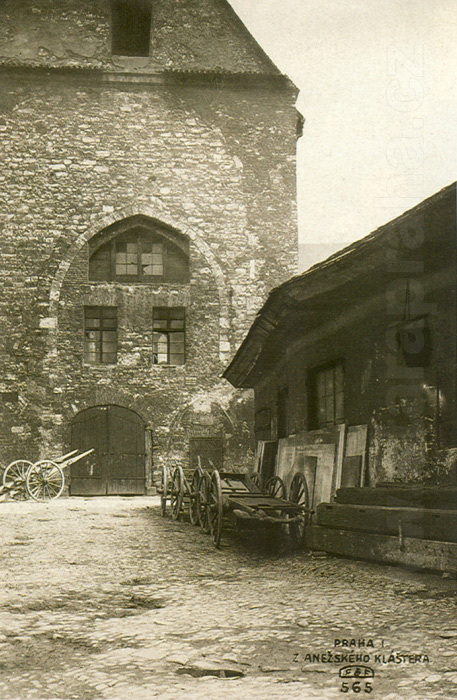 The picture dates from the time when most wagons were still drawn by horses, and so stables were part and parcel of the barracks. As a great deal of the Old Town still used petroleum for lighting, the firemen, wearing blue uniforms and black helmets and with hatchets in their broad belts, were summoned to fires rather frequently. At the same time, wearing their ceremonial uniforms, they were a welcome adornment of all public events, marches and festivities (see picture 180). PHOTOGRAPHIC POSTCARD. PICTURE AROUND 1910, PHOTOGRAPHER PROBABLY R. BRUNER-DVOŘÁK. Popularly called Vrabčírna (The Sparrow’s Nest) after one of the house-owners, Mr Vrabec (i.e. sparrow). The picture shows a view from Kozí Street. The two-storey gabled buildings on the left side, Nos. 820-817, were built on grounds purchased in the 16th century from the former garden of the St Agnes Convent, and they were demolished in 1955. That year saw also demolition of the more recent Husákovský Building, No. 816, appearing sixth in the row. The three-storey structure on the left, U Černého orla (The Black Eagle), No. 821, built in 1880, was demolished only in 1976. The street was also the home of a love lane where young misses wearing a great deal of make-up, as well as old hags (G. Včelička) stood in the doors, or tempted their clients from windows with orange and red curtains (instead of the characteristic red lanterns). The clientele was usually permanent and consisted of frequenters of local pubs, men working in all kinds of professions connected with the Vltava River, and also some of the barracked firemen. The younger and better-looking of the girls usually charged their customers 2 crowns for the act, the older ones even less. Both the Convent and the Church of St Francis were founded in 1233 by King Wenceslas I on the initiative of his sister, Anežka (Agnes) Přemyslid who became the first Abbess of the Convent. In 1240 a monastery was added to the ecclesiastical complex. The first stage of construction activities in early Gothic style was finished in 1260. However, the subsequent building efforts deprived this jewel of Gothic architecture of its stylistic unity. 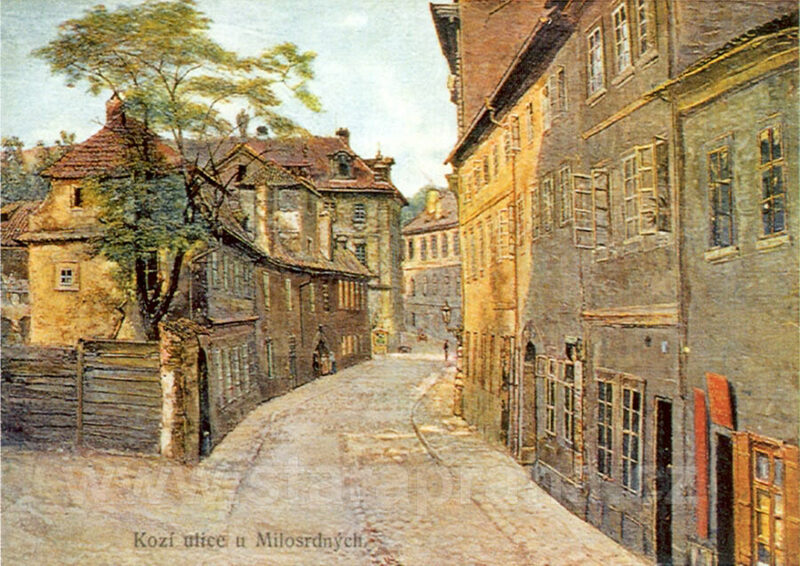 It faced the worst danger in 1783 when emperor Josef II abolished the Convent plus Monastery, and when it became a refuge of the poorest, and began to fall into disrepair, and then once again in the 1890s when it was earmarked for clearance.Fortunately, this plan failed to materialize. Actually, in the years 1892-1986, following substantial archeological research and design work, the complex was gradually restored. In 1978 this complex was declared a state protected cultural monument, and it now houses an exposition of the National Gallery. At the time of taking of the picture the Convent served as housing for the poor, as a storage place for coal and wood, as smithies, as workshop space for carpenters, locksmiths and glaziers. It was also known for production of bells by the renowned bell-founder depolt. The structure received its name from the shoemaker Sobotka who had his workshop here for many long years. The three-storey building, dating from the 16th century and added to the northern protective wall of the Monastery, was once owned by the Prague executioner J. Mydlář. In the 17th century another building, No. 829, was annexed, to which a further two storeys were added, judging from the prolonged chimney of the neighbouring building U Sobotků. At the time of Prague anti-Nazi uprising in May 1945, shots were fired from these buildings at German tanks then passing on the embankment. The return shots from the tanks damaged both buildings so seriously that soon they crumbled down. The tenants, warned by cracking in the walls were fortunate enough to leave the buildings in time. The Baroque portal with a statue above it is the northern entrance to the ecclesiastical complex. 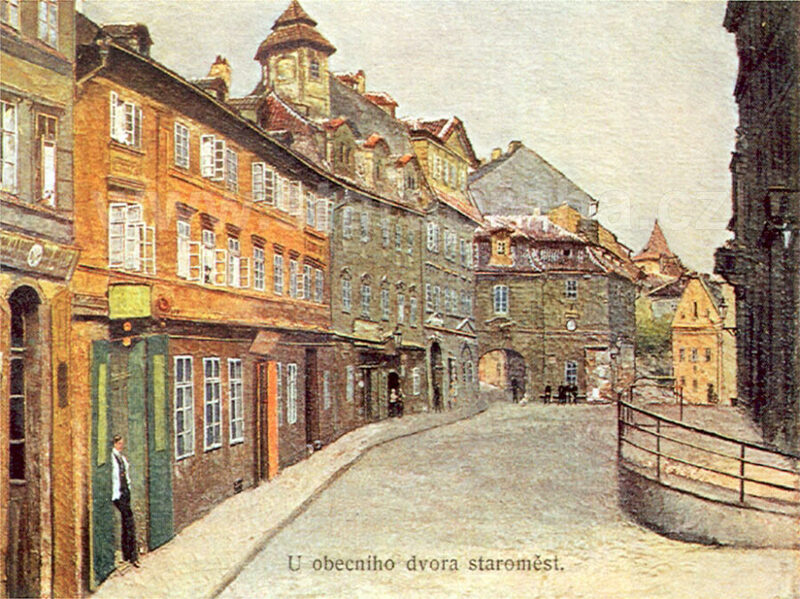 On the right, next to the portal (but not in the picture) was the legendary dive U Ročků, frequented by raftsmen, craftsmen and cartmen from the convent courtyards, but also by prostitutes from The Sparrow’s Nest (Vrabčírna) and the Mouse hole (Myší díra). Skirmishes, sometimes involving the use of knives, were part of the daily routine here. In terms of its reputation, the pub could only find its match in the Old Town dive Batalion. The direction of the view is opposite to that in picture 147. On the left is the corner building No. 1017, built on the site of demolished stables of the Municipal Courtyard in 1874, and the side wall of a prolonged northern tract of fire brigade barracks with a lantern, preserved until today. The three-storey building in the background is the Husákovský dům, No. 816 of 1850 (demolished in 1955). In front of it there is the building U Svaté Barbory (St Barbara), No. 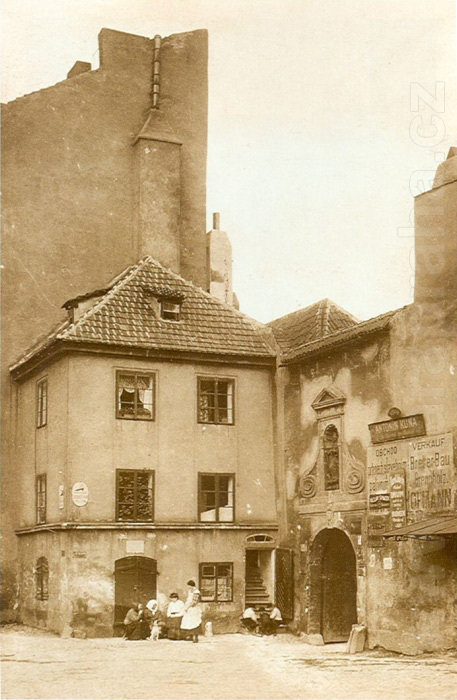 815, with the arc-like front, and the entrance to the pub U Hložků which was popular among drunkards from the vicinity because of its excellent mogador drink. It was demolished in 1935. On the extreme right we can see a part of the time-honoured 16th century building No. 814, in the 18th century the seat of the provost of the St Agnes Monastery. This structure with vaults, columns and wooden porches was used in the 1890s by the master baker Studecký who preserved here the century-long family tradition of baking. In contrast to this white craft, the smithy in the rear part of the building, busy with the repair of wagons, shoeing of horses and iron cladding of wheels, was permanently smoke-stained. The decaying building, as is the case with many other preserved structures in this area, is still awaiting its restoration. FOUR-COLOUR AUTOTYPE. 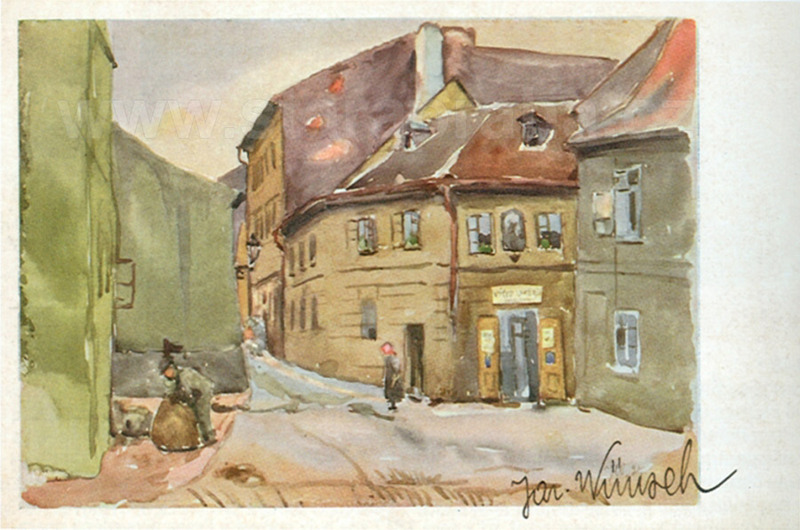 AFTER A WATER-COLOUR BY J. WÜNSCH, PROBABLY THE 1920s. Of buildings between U Obecního dvora Street in the east and Kozí Street in the west. The picture was taken from the third storey of the courtyard side of building No. 1002. 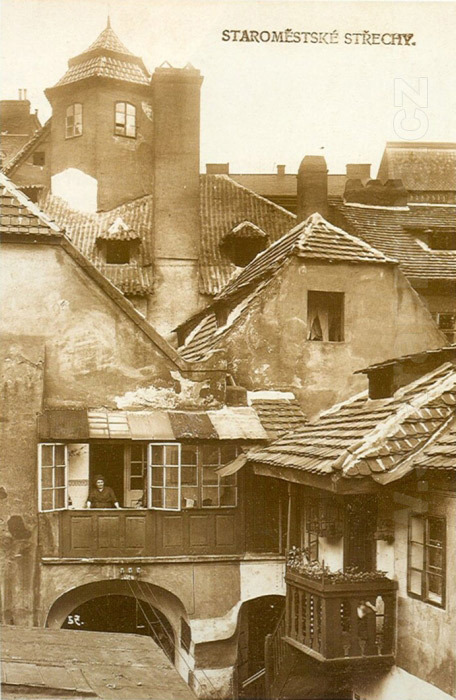 Towering over the pantile roofs, the chimneys turned black, and over the high wrinkled foreheads of extensions with wooden porches (G. Včelička) is the little hexagonal wooden mortar-plastered tower on the roof of the building U Cenzorů (the Censor’s House), No. 798. The building was owned after 1793 by the already cited censor Mayer. He was known for his liking for comfort, and so it surprised few when he had an elegant garden built in the courtyard, embellished with a statue by M. Braun and with a roof tower. Here, in complete peace and harmony, he devoted himself till the year 1848 to censoring wagonloads of books, manuscripts and translations delivered to him from the Censorship Office. From 1820 to 1835 the tower of the building was used as a studio by the painter A. Mánes. All contents of this website are protected by copyright. Copying, distribution or any other usage of the contents is strictly prohibited without a prior approval of the authors. Breaking of the copyright or an unauthorized usage of the contents of this website can be prosecuted within the civil and criminal trial.